Learn how to create a beautiful lobster drawing featuring this cool animal sketched with a shiny shell and nice digital effects! Lobsters are fun to eat, but these original creatures are also fun to illustrate. In this lesson, I will show you how to turn a simple version of this character into a gorgeous illustration. Two big claws are located on both sides of the character. Long antennas can be found on the head of this cute animal. Make sure the top of the head is round and the bottom flat. Eyes are made from small and large circular shapes. The tail is done using a triangle made with round corners. The abdomen consists of several layers. Don't forget to draw a big smiling mouth! Let's start this tutorial by sketching large shapes to be used as a guideline. 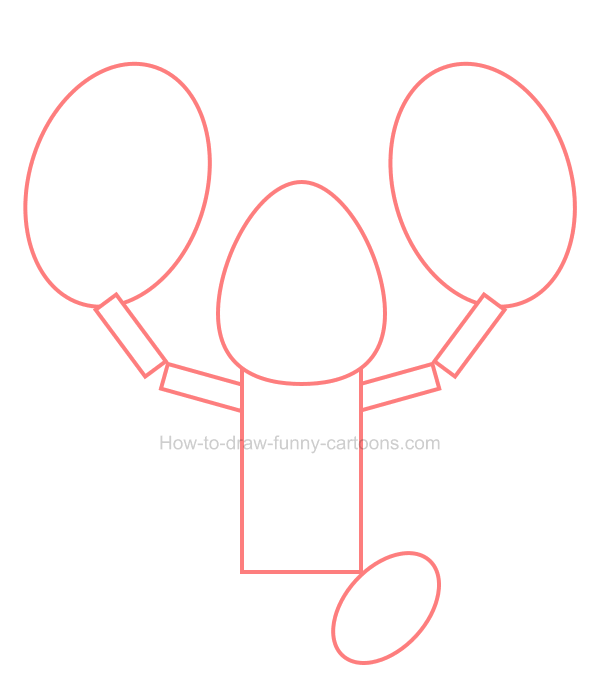 You can draw two large oval shapes for the claws, another one for the head (shaped like an egg), a rectangle for the body and smaller rectangles for both arms. The tail of the lobster drawing is represented by a medium oval shape. You can now use a mix of curved lines and straight ones to illustrate the character. Pay attention to the shape of the claws, the head and the body. Once you are finished, you can erase all shapes created in the previous step. Inside the head, sketch the eyes and the pupils using circles. The mouth is done using a long curved line. On both sides of the body, add six walking legs. These legs must be narrow, short and pointed on all ends. Good work! It's now time to add colors! Lobsters are usually filled with blue, green or orange colors. 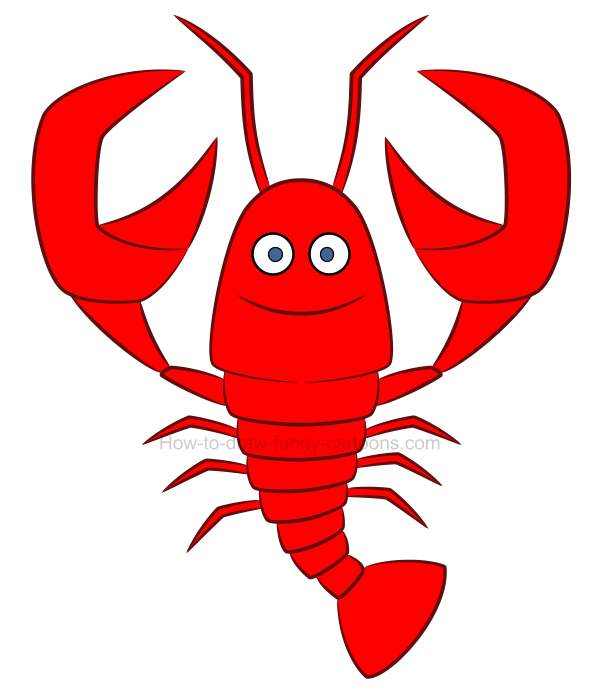 In the wonderful world of cartoons, these creatures are often red (like the cooked version of a lobster). Let's select this color. The eyes are white and pupils can be colored in blue. Strokes and outlines are also filled with a dark red color (unlike the black lines found in the previous step). If you are using a vector application, then it can be a good idea to use the gradient tool to create more depth and volume. 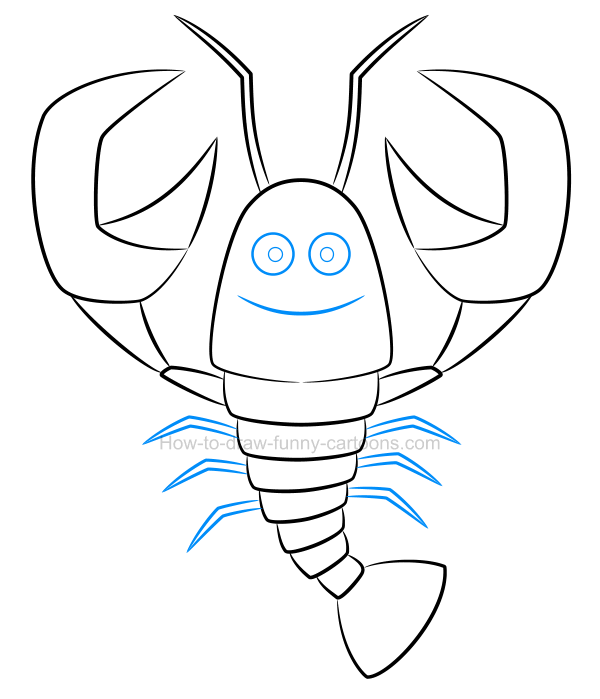 Simply select each shape of the lobster drawing individually and add a second color (usually a darker version of the color already found inside the selected shape). step 6 - Let's make this character shine! As shown below, you can draw more shapes inside each body part to create beautiful highlights. These new elements must be white. To complete the effect, use transparency to partially hide these new shapes. For example, you can see the effect near the forehead (but the part covering the bottom of the head is hidden). step 7 - even more effects to make it shinier! For this step, new thick lines were drawn on the claws, the head, the arms, the body and the tail. These shapes are white (but shown in green for this step) and are partially hidden too. These new additions are important to make the lobster drawing even shinier than ever! step 8 - Darker shadows to create contrast! 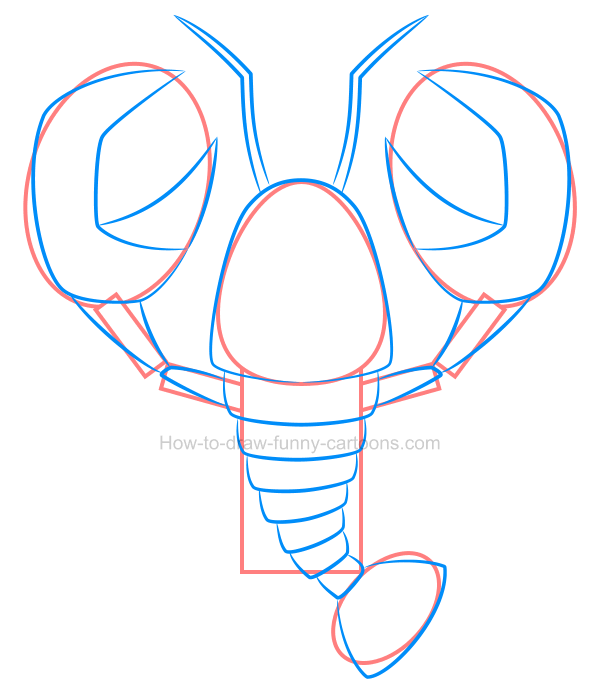 So far we have added all the shapes and effects needed to make the shell of the lobster drawing bright and shiny. However, it's also a good idea to create some darker areas to increase this impression of depth and volume. You can see all these new added shapes below (with a green outline). Of course, these new (and darker) shapes need to be slightly transparent to complete the effect. See how the cartoon lobster below feels alive and genuine? Yes, creating cool 3D effects can easily be done using a 2D application or even just pencils and some paper. 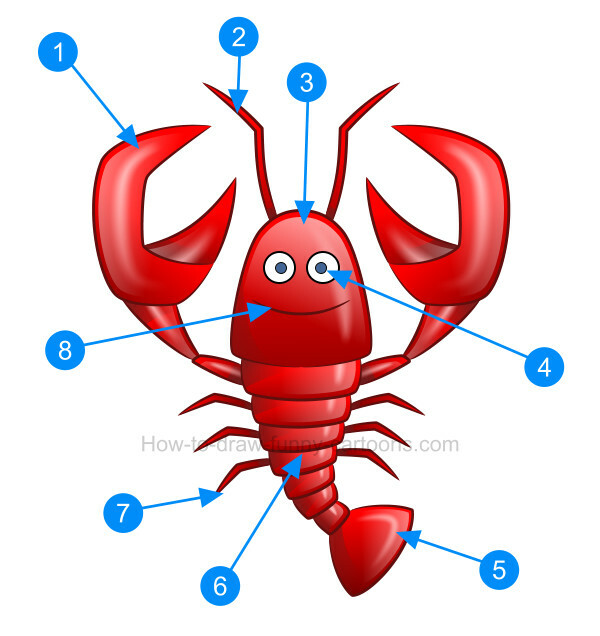 nine steps to create the perfect lobster!